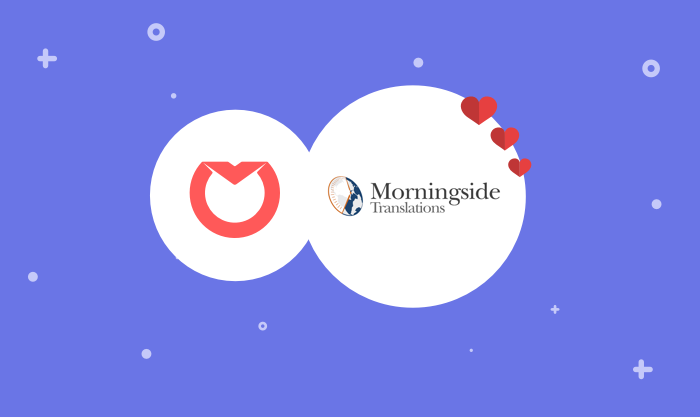 Morningside Translations provides a full suite of translation services in more than 150 languages to businesses in such industries as IT, life sciences, and legal. Their international team of 200 depends on Front to manage projects smoothly from start to finish. "Front brought our teams closer, reduced the amount of confusion with long email threads, and allowed us to fill in gaps in our workflow that other platforms could not address,” said Product Platform Specialist Nino Khetsuriani. Morningside works on long, highly collaborative projects for their clients. Before Front, they struggled with confusing forwarded email threads in Microsoft Exchange. Now, they use 10 shared inboxes in Front to manage projects between multiple teams — Account Services, Estimates, Reviewers, and more. Morningside’s projects go through multiple stages and iterations. They keep projects moving to the next stage with assignments, getting emails into the right hands instantly. With email threads that often get long and complicated, they can move individual emails to a new thread in Front. This allows them to stay organized. The Morningside team uses Front’s rules to automatically tag conversations by project stage or type. Then with Front’s Analytics, they can track volume for every stage or project. This allows them to better estimate timing for future projects and better distribute workload amongst teams in the business. As Morningside continues to grow, they’re confident Front will continue to connect and support their team. “Morningside relies on Front to organize effective communication between all departments involved in the project lifecycle. Since Front is highly customizable, we can configure our inboxes as needed to accommodate accelerated growth,” said Khetsuriani. Firebox's London-based ecommerce store switched from Zendesk to Front. They've saved 80 hours a week, and they respond to customers twice as fast.